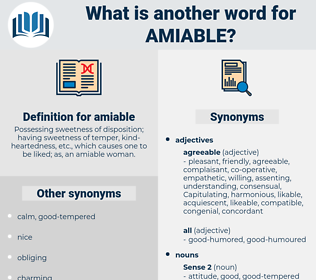 What is another word for amiable? Possessing sweetness of disposition; having sweetness of temper, kind- heartedness, etc., which causes one to be liked; as, an amiable woman. lovely, pleasant, gentle, agreeable, out-of-court, nice, informal, charming, polite, warm, intimate. unsociable, unkind, disagreeable, hateful, cold, surly, rude, aloof, mean, nasty, sad, hostile, repulsive, unhappy, crabby, irritable, testy, unfriendly, bad, unpleasant, gloomy, quarrelsome. crabbed, boorish, unattractive, cruel, ill-mannered, crusty, gruff, uncivil, vinegary, inconsiderate, ungracious, Unamiable, sullen, discourteous, unappealing, unlovely, ungenial, acrimonious, unmannerly, impolite, fussy, morose, ornery, dogged. I could see it at a glance - was all smiles, doing the amiable. I do it myself: but only where there have been amiable efforts. 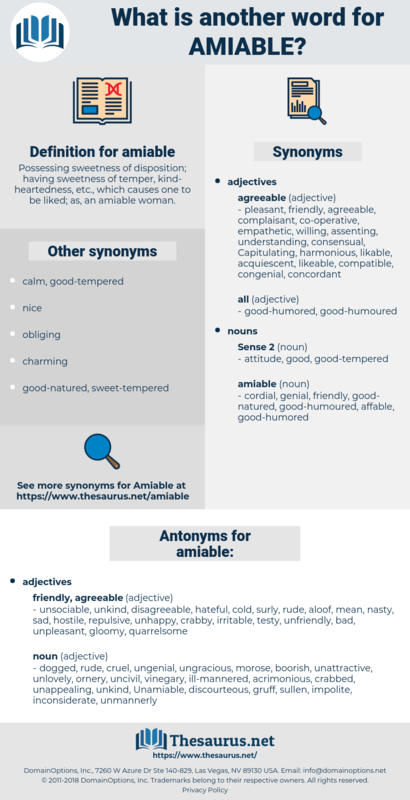 amphibole, amble, anvil, amphiboly, ampoule, ampul, ample, ampule, ampulla, amply, amiably, amenable.